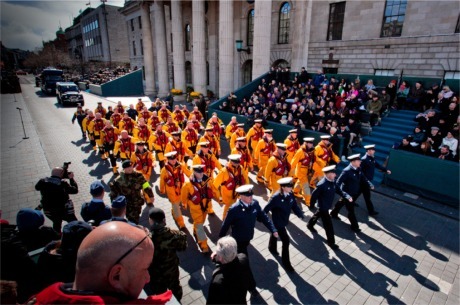 MEMBERS of Buncrana lifeboat crew were among 700 emergency responders who took part in the 1916 Easter centenary commemorations in Dublin at the weekend. The local RNLI volunteers gathered themselves for the national commemorations barely a week after the most traumatic rescue and recovery mission in their proud history. Four Donegal volunteers were among 50 from RNLI stations nationwide who made the trip for the historic parade. They were Paddy Murphy, Seamus McDaid and Sean Quirke from Lough Swilly RNLI and Shane Smyth from Bundoran RNLI. Buncrana lifeboat crew members march along with colleagues from other RNLI stations in the national 1916 centenary commemorations on Easter Sunday, March 27, 2016. The Lough Swilly crew were the first responders to the horrific multiple drowning at their base at Buncrana Pier on Sunday, March 20. Many of them said it was the saddest mission they had encountered. The freak accident claimed the lives of Derry dad Sean McGrotty (46) his sons Mark (12) and Evan (8) his mother-in-law Ruth Daniels (57) and her daughter Jodie Lee (14). Mr McGrotty's baby daughter Rioghnach Ann (4 mths) was dramatically rescued when she was thrust by her father into the hands of the Donegal footballer Davitt Walsh who managed, exhausted, to get the baby safely back to shore. As communities in Inishowen and Derry are attempting to resume normal activity in the wake of the overwhelming loss of life, thoughts of grief-stricken widow Louise Daniels (35) and her daughter are not far from mind. Fundraising to support the devastated family, both online and locally, is continuing with the amount gathered now approaching 100,000 euro. Car washes, concerts and collection boxes are also still being organised. Meanwhile, Davitt Walsh's proud girlfriend made a modest appeal to an Irish sporting legend yesterday for a token to help lift her partner's spirits after his harrowing ordeal. Stephanie Knox, who also played a part in the Rioghnach Ann's rescue, took to social media in a bid to get a signed Ronan O'Gara rugby jersey. "I was one of the rescuers of the Buncrana tragedy - Davitt Walsh's girlfriend. I would love to get him a signed top from @RonanOGara10, plz help," the cardiac physiologist tweeted. O'Gara was among the millions of people who were deeply moved by the Kerrykeel footballer's powerful interview on RTE's Six One News. A clip of his harrowing eyewitness account has now been viewed over 3.5 million times online. "Such horrendous scenes from Buncrana. What a man Davitt Walsh is," O'Gara tweeted his 335,000 followers while sending his sympathies to the bereaved family and locals in Buncrana.